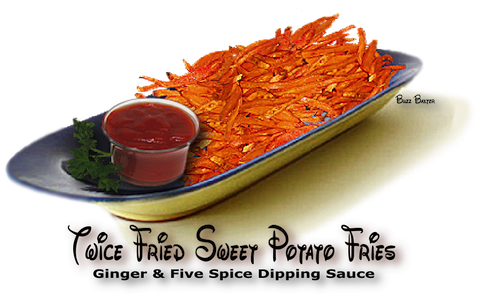 Sweet potato fries done right are a real taste sensation and good for you as well. Twice fried gives you the crispy outside and the sweet creamy inside you would expect from these delicious fries. the cut potatoes in a bowl of ice water to release some of the starch and to keep them from browning. temperature does not plummet. Cook for 3 minutes until they are soft but not browned. 3. Remove the potatoes with a long-handled metal strainer and drain on brown paper bags. 5. Drain on fresh brown paper bags then place in a serving bowl lined with paper towels. Salt and serve immediately. 1. In a medium nonreactive saucepan, heat canola oil and add onion, garlic, dry mustard and salt. Cook for about 10 minutes, until softened. tomatoes with the back of a wooden spoon while cooking. 3. Add light brown sugar and rice vinegar and continue to cook, stirring for another 10 minutes, until mixture has a thick sauce consistency. and refrigerating. Ketchup will keep, covered and refrigerated, for about a month. NOTE: ALTHOUGH NOT THE EXACT RECIPE PRESENTED,  THE VIDEO BELOW MIGHT BE OF HELP TO YOU.